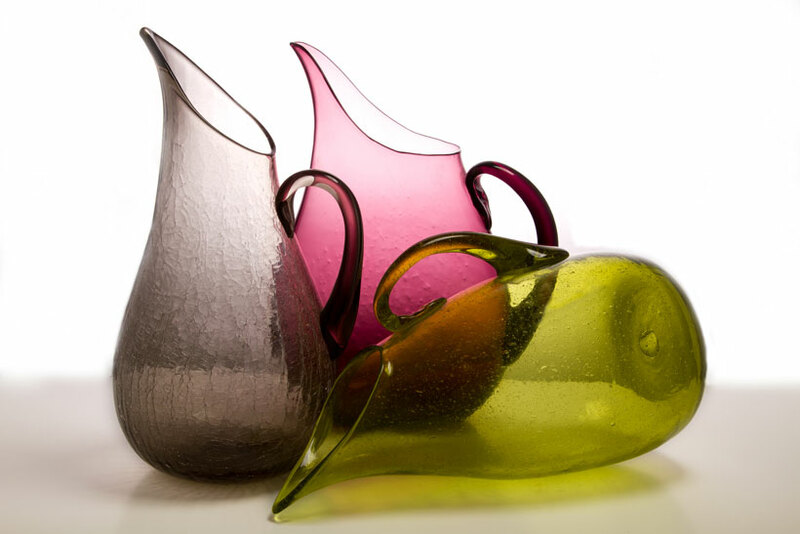 Blenko Glass Co., a handmade glass manufacturer, started in 1893. Seeking to make glass using natural gas, John Blenko brought his glassmaker talents from London to America and started the company. 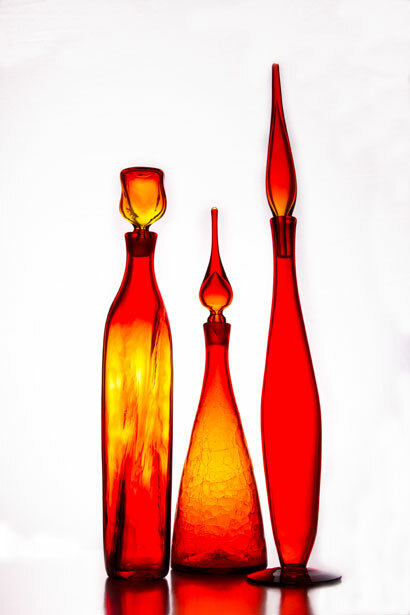 Initially, John named his company Eureka Art Glass as he had discovered a formula for a true red glass, but according to Dean the name changed in the 1920s to reflect the family ownership. Despite its long history, the Blenko technique has not changed much over the years—although it is anything but predictable. “We have long used diverse techniques—mouth blown into wooden and metal molds, cast into a dump mold, and on it goes. Our processes are not one, but several,” Dean says. The result of these varying techniques is over 120 years of stunning glassware creations—each with unique characteristics, bold colors and artful form. 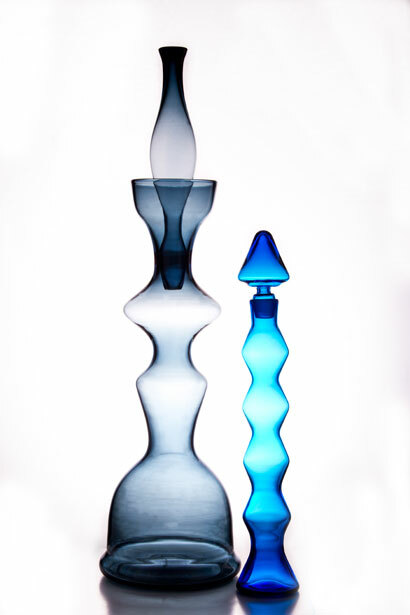 Thanks to the talent behind each Blenko creation, these items are far more than just a piece of glass. The midcentury era pieces still captivate collectors due to their rainbow of hues, sensual silhouettes and inspired designs. Despite their undeniable beauty, properly identifying a piece of Blenko glass can require some legwork. Lost stickers, mimicked designs and a misunderstanding of what exactly the company produced are often the culprits that lead well-intentioned collectors astray. Dean notes that because Blenko did not mark its wares for decades and because the brand’s style has been widely imitated, identification can indeed be difficult. 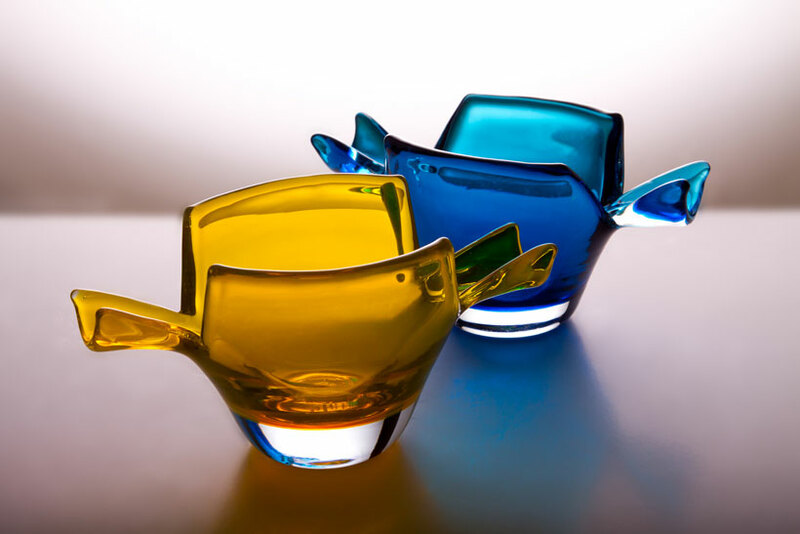 Since Blenko did and does not follow a specific pattern, the general organic form of their glassware is at times similar to wares of other manufacturers. “Most—by far the majority [of]—pieces will not have the sticker. It was intended as a point of sale identification, not long-term identification,” Dean says. Yet even without a sticker, identification is anything but hopeless. As Dean points out, “There are endless resources.” He suggests turning to books, many of which are essentially reprints of the annual Blenko catalogs, as well as collector-run websites that show the catalogs. Other than that, he says that identification comes down to studying the forms and shapes. #418S, #284 and #418L in Amethyst. While many collectables have an average price range, Dean says that for Blenko, it simply is “not possible.” The large variety of midcentury designs and their varying interest to collectors cause prices to vary widely. 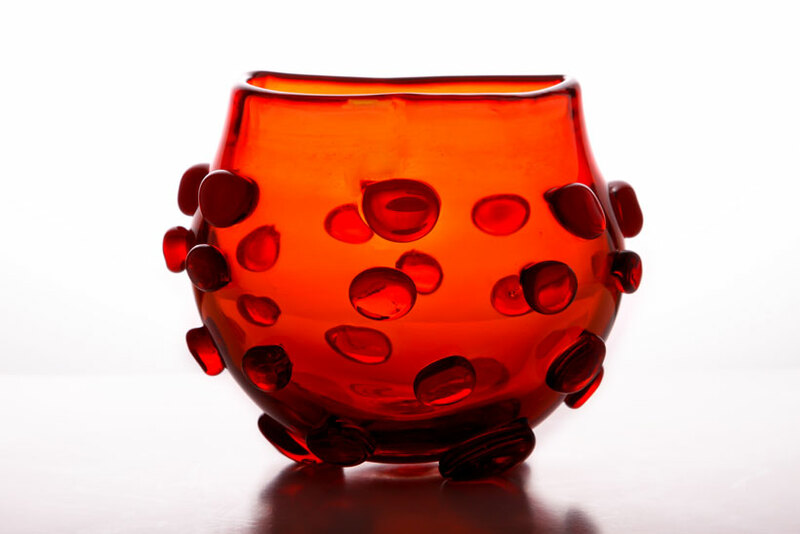 “Small but desired items—like the 1964 series of vases—sell well but are modestly priced. Large piece can be in the neighborhood of $1,500 to $2,000 on the market now,” he says. The vivid orange in these pieces is a particularly sought-after shade. Color has a massive impact on the value of a piece. 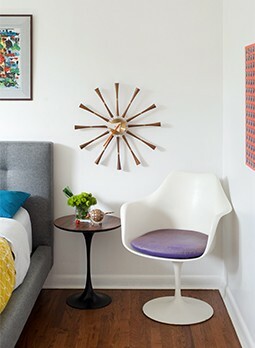 According to Dean, period colors like smoky grays and vibrant oranges are considered strong examples of midcentury production and are therefore highly sought after. “Pieces in colors that were not introduced into the official line also have appeal. These were samples, experimental pieces and occasionally pieces made for a single account—such as a large department store. These may be recognizable forms but in colors that are less common,” Dean says. “Call them floor decanters, architectural pieces or whatever, but it’s the near or over 30-inch tall pieces that seem most constant in demand.” When those large-scale pieces have interesting stoppers or overall form, their demand only increases. Dean notes that some collectors follow specific Blenko designers, but he describes those trends as “erratic followings and not stable markets.” Rather, most collectors follow the brand as a whole, seeking out specific colors, a favorite year or a similar line of items—such as the floor decanters. According to Dean, in the midcentury smoking items accounted for up to three pages of content in the annual Blenko catalogs. Still in operation in Milton, West Virginia, Blenko now makes hand blown sheet glass for stained and leaded glass windows, cast items for architectural uses, specialty items for private customers as well as novelty items, giftware and tableware. Dean weighs in on popular tips used to identify Blenko pieces. Tip: Check for transparency and avoid opaque or translucent—with the exceptions being yellow glass and the Rialto Specialty Line. “But for colors in the catalogued lines and during the 1945 to 1970 era this is largely true,” Dean says. Tip: All glass will have the same rim thickness and be both rounded and smooth. Verdict: “Not always. Not even close. Tip: Reference against design number in the annual catalog. Verdict: “Good, but who has access to the catalogs? “Buy the books of catalog reprints or use online resources,” Dean says. His better tip is to confirm designs against line numbers, as that is what Blenko uses to refer to what others might call design numbers. Tip: Look for an unfinished or otherwise rough pontil mark. Verdict: “None should be rough. Lucky enough to have a piece of Blenko? Follow Dean’s tips for ensuring your collectable has a long life. • Do not put Blenko in the dishwasher. Exposure to the high temperatures and pressure will pit and cloud the surface over time. • Never put hot or boiling water into any silica-based glass. • Do not expose the glass to extreme variations in temperature—be it cold or hot. Glass is a tough material, but in the interest of long-term enjoyment it is best to gently wash and not stress vintage glass.